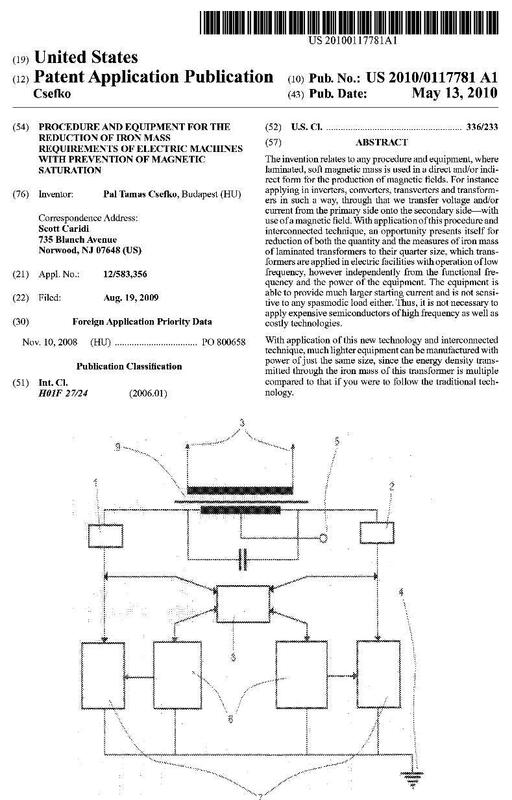 Procedure and equipment for the reduction of iron mass requirements of electric machines with prevention of magnetic saturation. 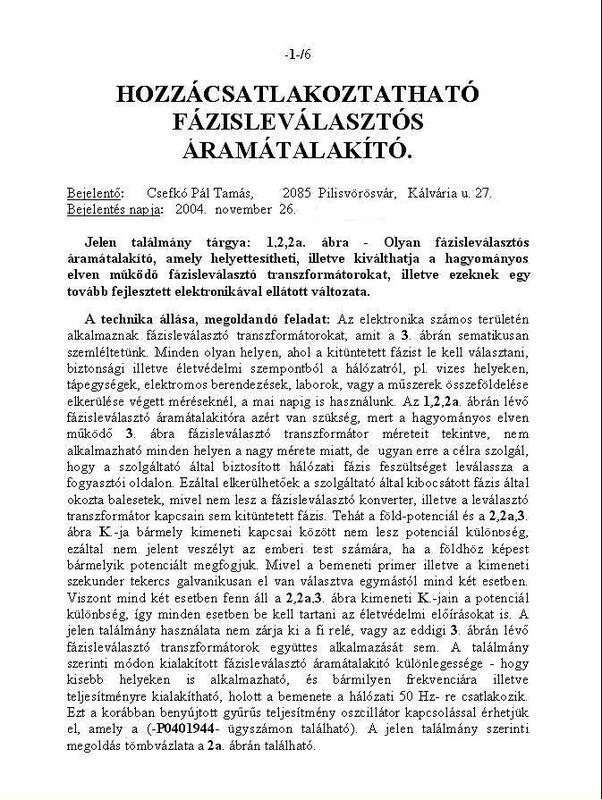 Hungarian version of the country previously filed PCT patent. Procedure and equipment for water/wind generators' performance improvement with the addition of a pneumatic system. Procedure and equipment for the production of hybrid generator connected in parallel to the internal energy storage integrated mobile inverter unit. combustion engine and the inverter unit Performance will be aggregated, so the unit's start-up performance is increasing, so the inductive equipment brought in more security. 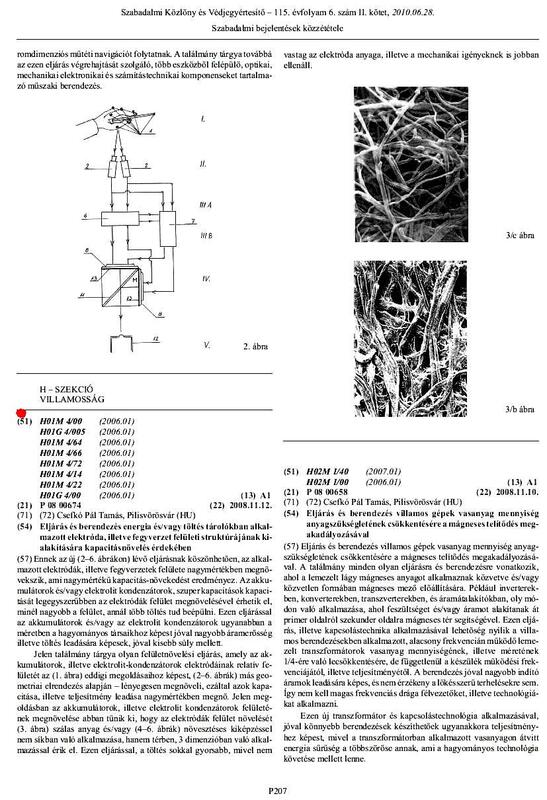 Procedure and equipment for energy and / or charge storage electrodes applied to the surface structure and armaments development to increase capacity. a much larger charging current or casting will be able to do. Lighter weight and geometric Due to construction, the mechanical stress is more resistant. Procedures and equipment, electrical machinery Ironware need to reduce the quantity of materials preventing magnetic saturation. 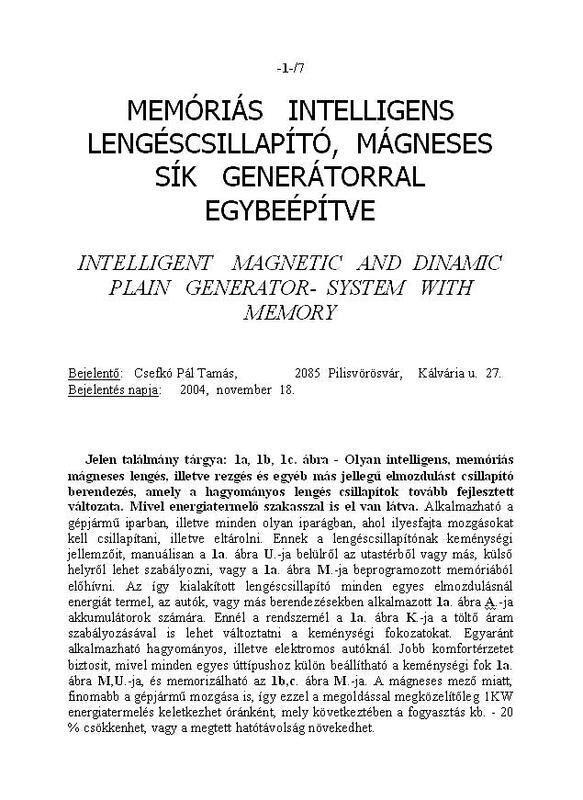 The invention relates to all procedures and equipment, where the soft magnetic material is applied directly plated and / or direct form, producing a magnetic field, eg. inverters, converters, transverters, electric motors, etc.. The procedure and switching technology opportunities will be used in transformers iron shed, or 1 / 4 for the performance and the frequency independently. In a new transformer and switching technology, still use the same power in relation to equipment is much easier to be created. 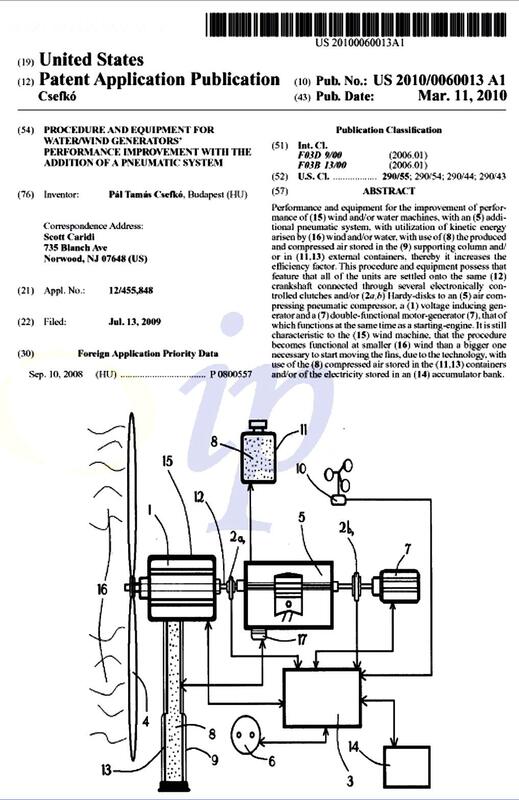 Procedure and equipment for wind and / or water-plant Power factor improvement, additional pneumatic system put in place. This procedure and equipment in the existing wind and / or water-plant coefficient of performance increase, thus a much greater yield be able to have installed energy- equipment. The device not only power factor improvement, but not for energy chemical means to store all in one. This will be overcome in the "valley" period-s, and, most importantly, that there is no time bound by a removable power. Procedures and equipment and additives water mist ultrasonic preparation and the combustion chamber of internal combustion engines introduce. 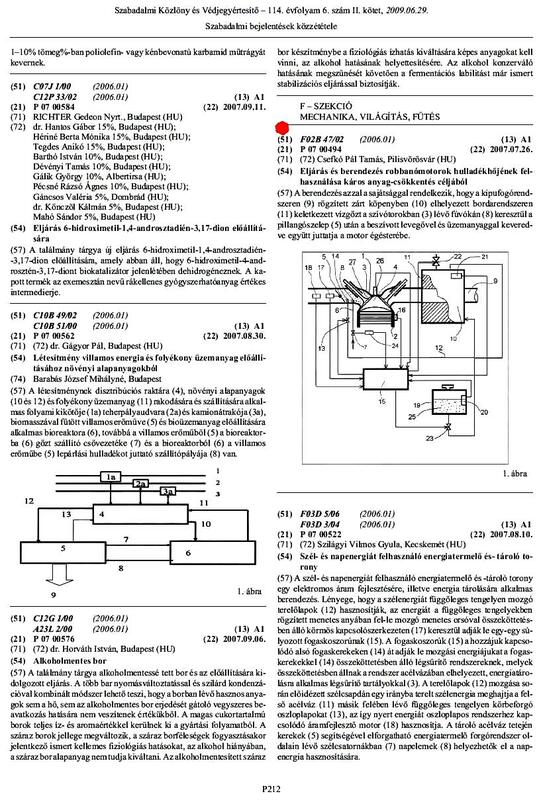 This procedure will help the water and fuel even confusion, or molecules normalization, making the fuel and vízkeverék combustion for better efficiency the engine's combustion chamber, increases the engine performance, and reduced consumption of the engine, and CO emissions reduced to a minimal. In procedure to reduce the engine performance catalyst can be omitted. Combustion of waste heat utilization, pollutant reduction purposes. 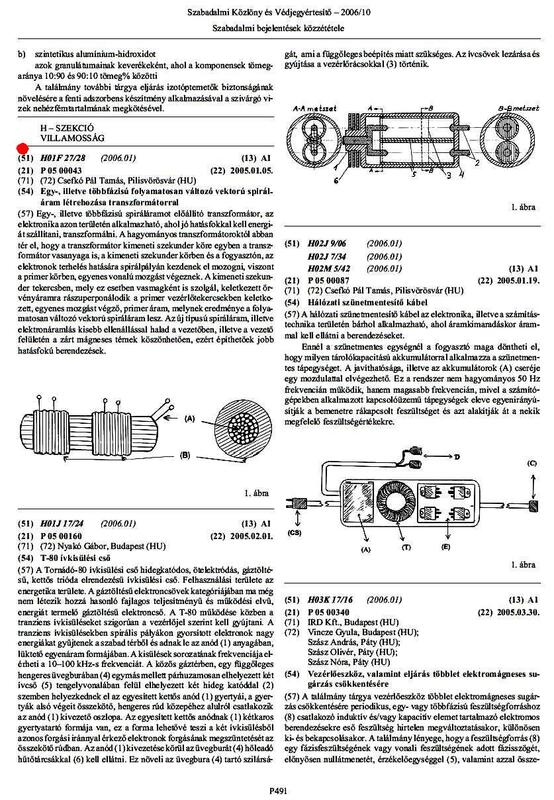 This procedure is the engine using the waste heat facilitate the smooth water and fuel confusion, making the fuel and vízkeverék to provide more efficient combustion the engine's combustion chamber, increases the engine performance, and reduced consumption of the engine, and CO emissions reduced to a minimal. In procedure to reduce the engine performance catalyst can be omitted. Procedures and equipment to reduce emissions fog in the burn area through the transfer of the air through. 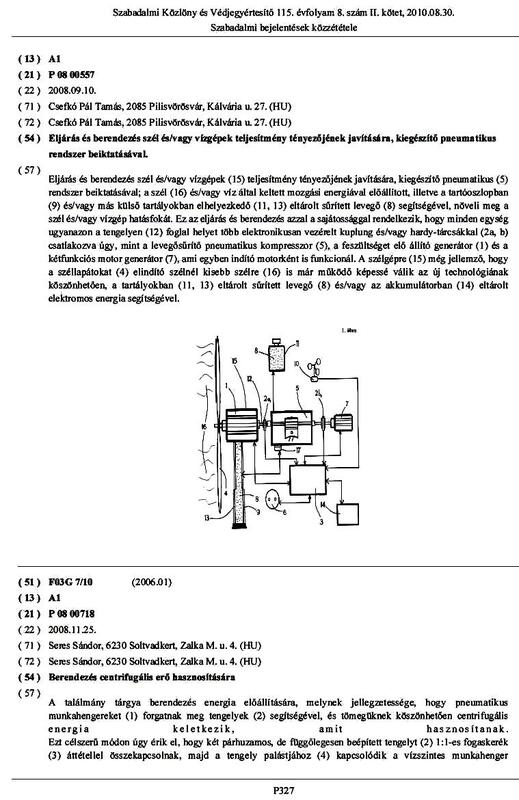 This procedure will help the water and fuel even confusion, or molecules normalization, and thus the fuel vízkeverék provides better efficiency level of incineration the engine's combustion chamber, an increase in engine performance, and reduced consumption of the engine, and fraction of the CO emission decreases. This procedure to reduce the engine performance catalyst can be omitted. 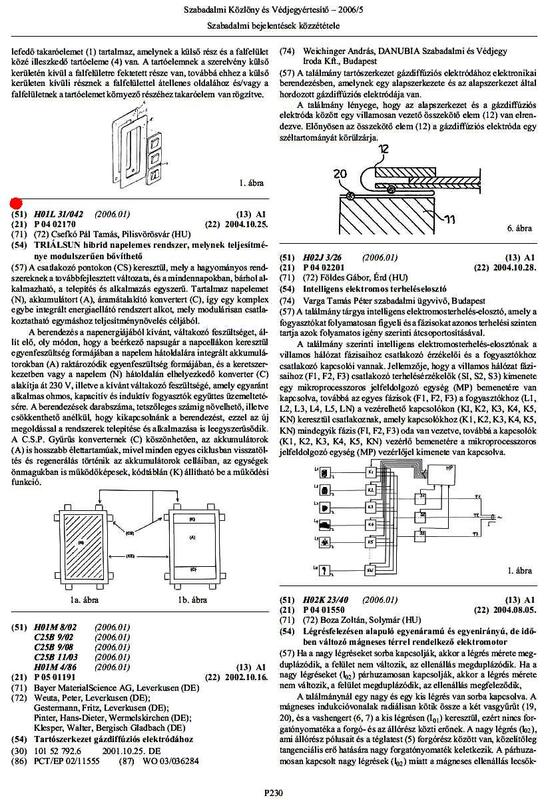 Trigger used in computing szünetmentesítő large circuits, less space, or the computer power supply can be built, cheaper to produce, gives you more power than the same volumes of relation, etc..
A multi-stage or continuously variable vector spiral flow creating a transformer. Create a special power which the load the effect is not the driver but the driver moving on the surface of less resistance, even low frequencies so that better efficiency be built with equipment, etc..
One or multi-phase AC or DC AC power - power and propulsion Control c.s.p. converter. Any design motors In order to achieve better efficiency (eg disabled vehicle, truck, golf cart, etc). The capacity of the batteries, the longer while in operation for one or the batteries at the time of regeneration Also, etc..
Would be connected to phase separation converters. Family homes and other institutions Wall connectors from your network, accident prevention purposes, and instrumentation measurements of the earth to eliminate this problem, etc.. Solar Charger unit fitted systematically expanded power module mobile source. These mobile devices anywhere communicating the electrical network. 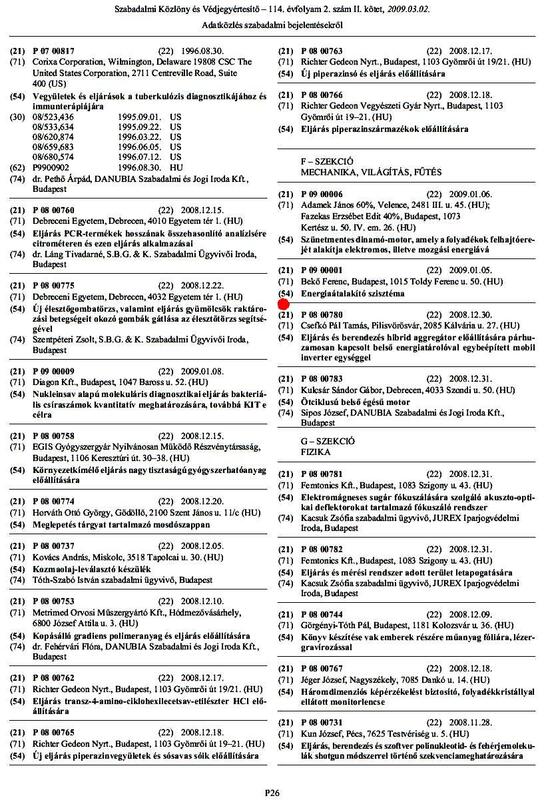 Application areas: supply of farmland, Planes, ships deck. 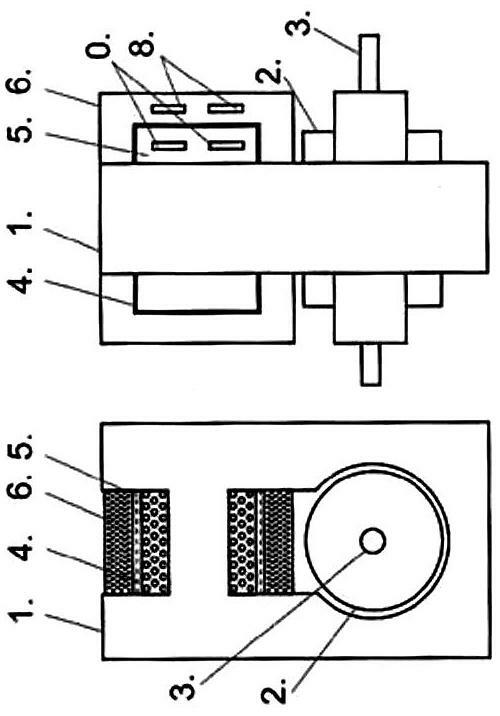 Wet, wet environment used for trouble, Whereas the ground and between the output of the device there is no potential difference. 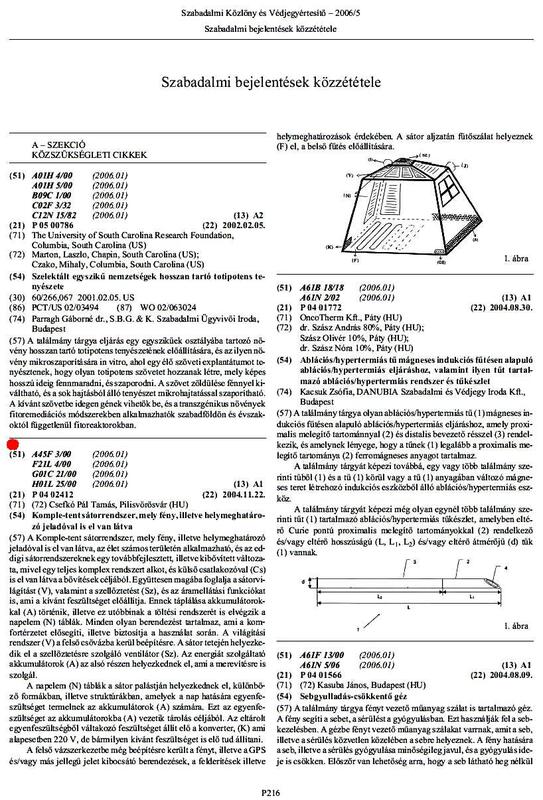 Substituted heavy-polluting aggregátorokat, each cycle, a part of the energy restores and regenerates the battery it, etc..
Tents KOMPLET-tent, which is light, and transmitter to your location is equipped. Tents of the light, and positioning transmitter is equipped. Shelf can be diverse civil life and military alike. Mountain-climbers, avalanche dangerous places makes it easier to search, disaster-stricken areas and the army mobile formations to accommodate both suitable for even the set up temporary hospitals it, etc..
Smart shock memory, plane combined with a magnetic generator. The new generation of shock absorbers, all each pitch-out and move away from energy produce motor vehicles for which this solution, do not waste your motion generated energy. 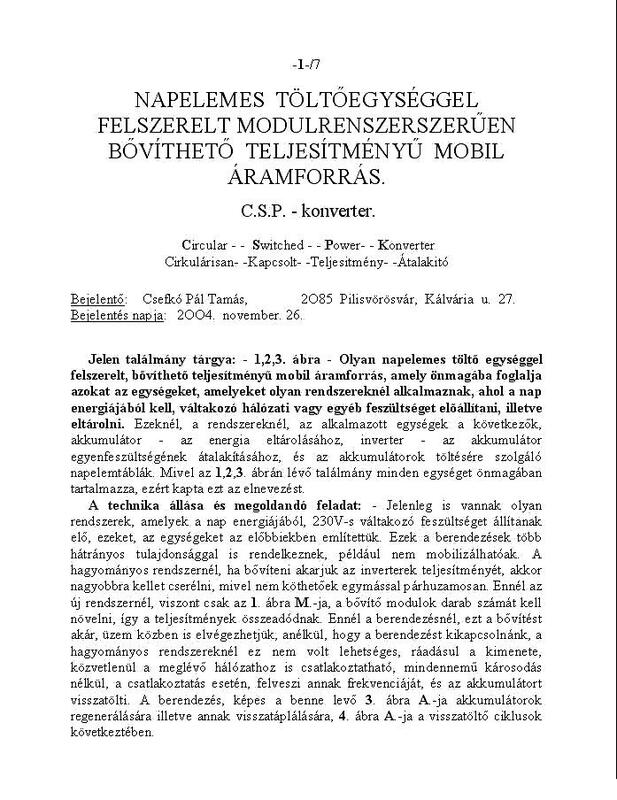 The consumption of motor vehicles by up to 30% can be reduced. It increases convenience, since the cabin from Hardness adjustable shock absorbers. Measurements can be used for the design, (Eg, trucks meter) immediately disclose the road conditions. TRIALSUN hybrid solar system, of which performance modular expandable. The output of the solar cell modules, 230V output voltage arises, and not a low DC voltage, since it is difficult to lead without any losses. 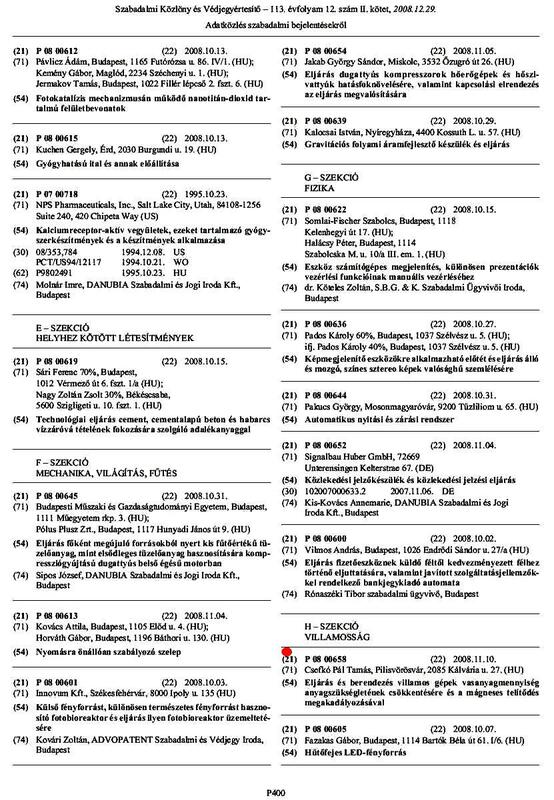 A module contains a solar cell, battery and a special transformers, which basic patent are described here. With this solution, at least 30% reduced losses, so a module efficiency can reach of 30% in the general 10-12% compared with al. 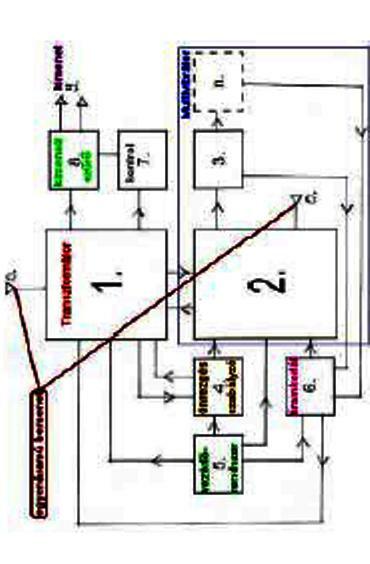 The course modules are linked in parallel, up during operation. Basic multi-part system, the some basic direction of enhanced version. 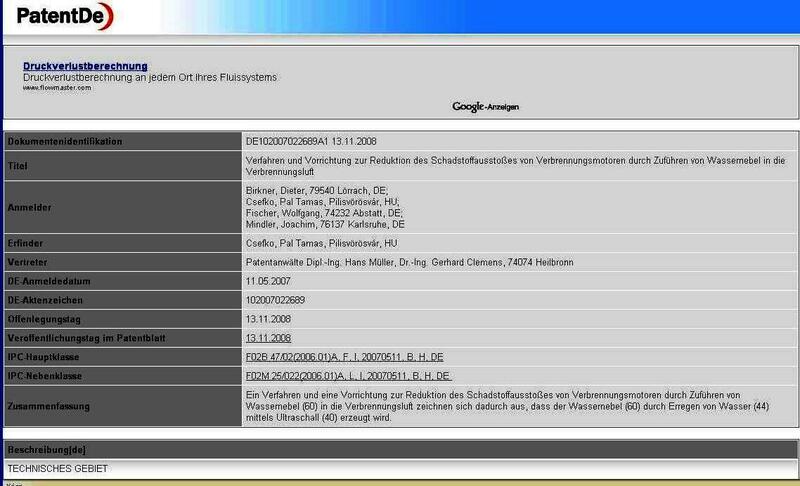 The patent system more developed in. 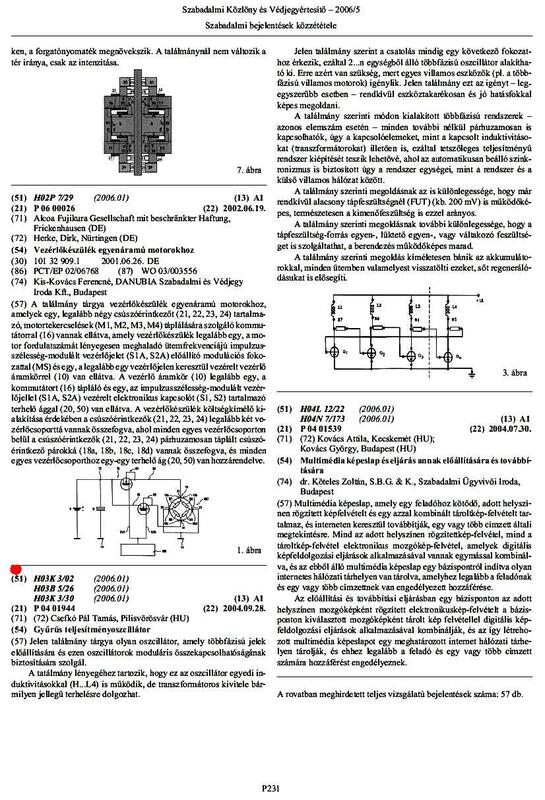 The first patent was for the module should be added a systematic performance transformer, which during operation can be extended. Basic, may be part of a range of equipment. 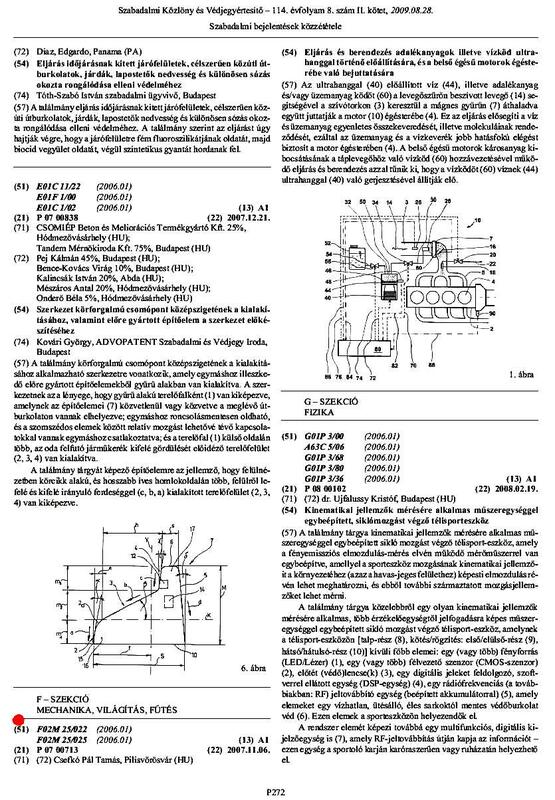 Several directions can be further developed version of the new system of motors, The device developed in a number of patent.